THE QUILTED PINEAPPLE: Who Doesn't Love A Good Pumpkin Party? I just finished my latest project, "Pumpkin Party" by Sherri Falls of This & That. This was a fun and easy project to piece. I actually bought the kit last October, well you know how that goes. I finished the top this September. I love how it turned out! This quilt had a lot of open areas to really have fun with the quilting. I especially like how the quilting added a lot of character to the pumpkins, BUT I was ready to abandon ship quite a few times while quilting this. I have found that sometimes it's the small projects that give you the most grief! For some reason, the thread I used on all the light background quilting and I were having a serious disagreement! It was down right ugly at times. Words were exchanged that I can't even repeat! 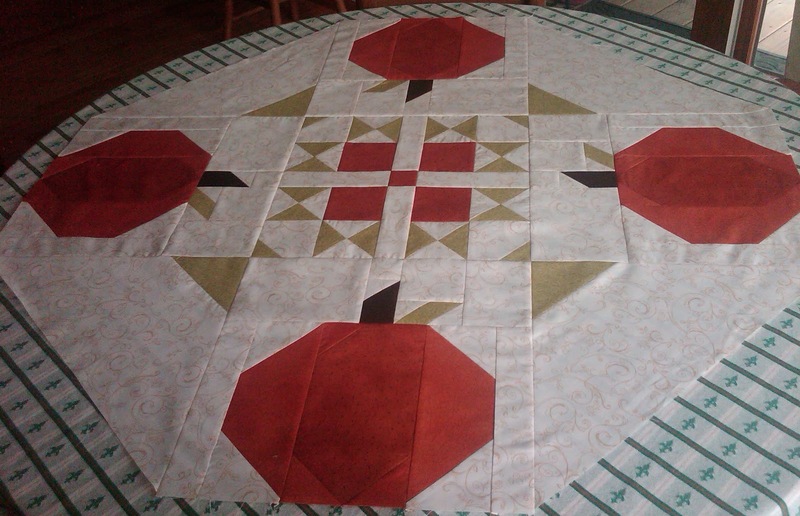 I had A LOT of starts and stops while quilting, so it took me f-o-r-e-v-e-r to finish. I'm sure it was operator error. If I hadn't had enough, the colors bled when I sprayed water on the top to dissolve some water soluble thread. I did get it all out. Luckily, the wash really made the quilting pop. In the end, I love my new topper and it was well worth the troubles. As always, your quilting is PHENOMENAL! I love that topper and the quilting is beautiful! What a lovely and fun table topper!! Welcome to blogland!! Nicole sent me over to help greet you into cyberspace!! It is wonderful. I love all the quilting you did. I found your blog through my friend Nicole. Wow, I love the design of your blog and your quilts. Welcome to Blogland! What a great table topper! I adore how you quilted it. Your quilting is terrific! That topper is just the perfect size for your kitchen table (and mine!!!) I am going to look for that pattern. I doubt I could quilt it as nicely as you did yours though! I just came here from Sister's Choice blog and am glad i stopped in. 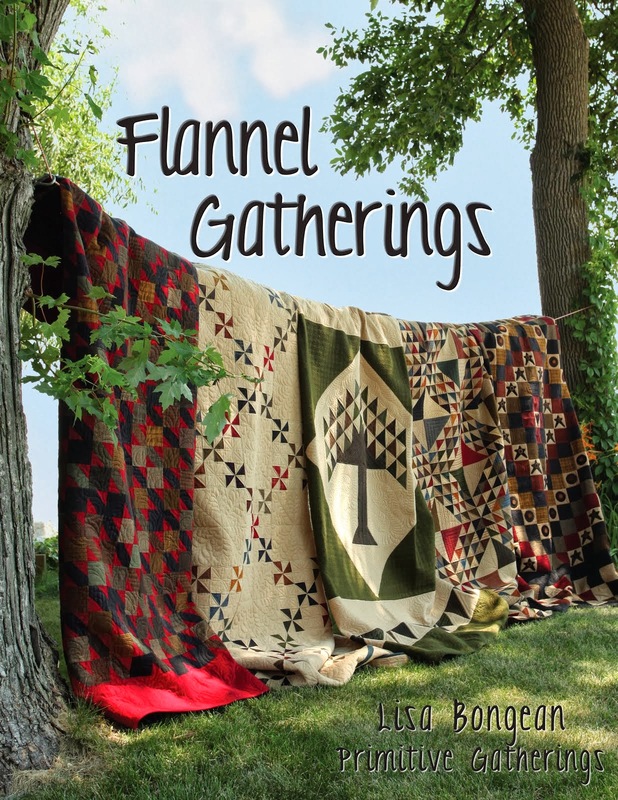 You have some wonderful quilts and quilting to share so welcome to blogging and I am looking forward to seeing what other things you come up with! Welcome to Blogland!! I loved your blog so much that I signed up to follow!! Love ALL your projects!! Take care and I look forward to reading more about your many projects!! Welcome to Blogland, Linda! I came over from Nicole at Sister's Choice! 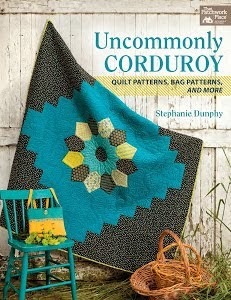 You're a gal after my own heart with your pumpkin quilt and wool projects! Wishing you the best in your new journey! Welcome to the world of blogging, Love how you incorporated the leaves into your spirals, it's amazing how a top comes to life once it's quilted. Very nice. I love your pumpkin topper! Your quilting is Fabulous! The quilting in the pumpkin is perfect, it really does make them look real. Look at you, popular girl!! I'm so glad you're getting some attention, your blog and quilting are very attractive! I just love that pumpkin table topper, it looks like it was custom made for your kitchen table, I guess in a way it was! Lovely job all the way around! Welcome to blogging.ooking forward to seeing your quilts. Congratulations rookie! Great start. I found you via Nicole. My name is Linda too! I love the Redware Crow mat and your title for Lisa Bongean. I agree...the Queen! I love the table topper! I think I will also look for that pattern. You did an amazing job on fmq. Can't wait to read more of your posts! Nicole sent me over to say hello and I think I will stay! Your work is beautiful and inspiring. And your writing is fun. Good work all around. Love your pumpkin table topper... and the quilting ... and your blog too. You are now one of my favorites. Have a wonderful weekend and can't wait to see what you are working on next!! Love your tabletopper and I'm glad your first week in the blogging community has been so much fun for you. Welcome to blogland! Nicole send me over to say hi. Love your tabletopper...your swirling leaves quilting is amazing! What a great job you did setting up your blog. Enjoyed reading all of it keep up the good job. Love you.